The Newest Rant: My Visit to the January 2018 Toyman Show Was Extremely Fun! My Visit to the January 2018 Toyman Show Was Extremely Fun! I bought the Walgreens Green Goblin Chase Funko which is a, "Chase," because it has a gorgeous metallic sheen. Also, I had the pleasure of speaking with the great folk from STL Comics and trading some stuff for a Funko of the Philly Phanatic from them, a cool figure to have because he just looks so zany. Lastly, I was pleased to trade one Funko I had brought with me for this awesome one of Bullseye, the dog who is the mascot for Target. Some copies of, "Teen Titans #12," which feature the first appearance of, "The Batman Who Laughs," and is quite the hot book right now. I got enough to keep one for myself and some others to sell to friends. "Marvel Spotlight #28," which is the first solo Moon Knight series. I was stoked to get this from the good folk at The Comic Grind who let me swap some other comics of mine for it. 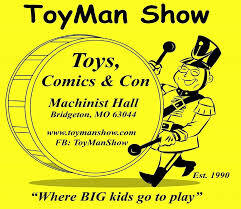 The Toyman show is always fun and I was very pleased to find so much great stuff this time. Thanks to Chris' awesome event I always have a superb time. It is extremely fairly priced and full of awesome comics, toys, and general fascinating pop-culture ephemera. If you come for general admission at 9AM it is only $5 (with kids 16 and under free) or you can get in as an early-bird at 8AM for $12--which is something I for sure would recommend if you want prime first-pickings. The next one is Sunday, March 11th, and I plan on being there without a doubt!